BERLIN -- BMW and Porsche are predicting record sales for their cars this year, but are vying to find enough engineers to make them. An aging work force and declining enrollment in technical studies caused the shortfall of available engineers in Germany to rise to an all-time high of about 77,000 last month, according to the VDI German engineering association. BMW aims to hire 800 people at its factory in Leipzig, as part of a 400 million-euro ($577 million) expansion for the production of the i3 electric minicar and the i8 electric supercar. Porsche is recruiting more than 1,000 workers for its plant about 17km away, where it plans to add the new Cajun compact SUV. "Until about two years ago we had hardly heard of companies in the region struggling to find skilled staff," Leipzig Mayor Burkhard Jung said in an interview. "But the scarcity of engineers appears to have become an issue now." 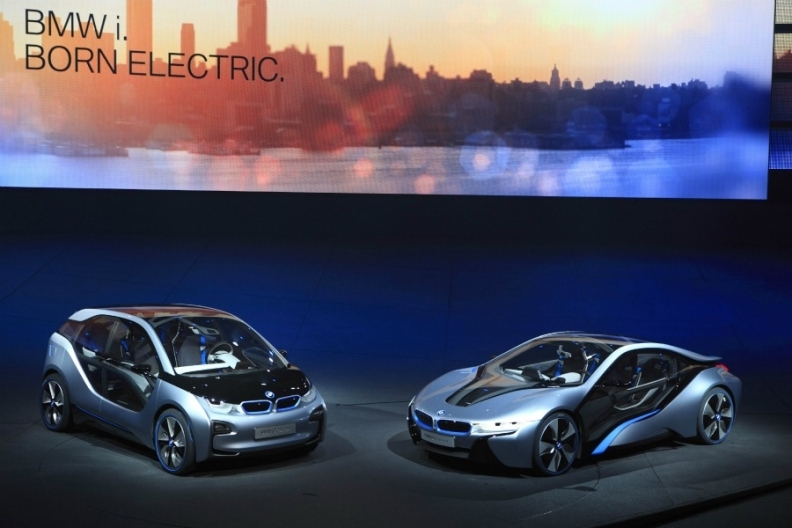 The shortage may threaten the competitiveness of BMW, Porsche, Volkswagen and Daimler as they expand and boost development of electric vehicles. A third of Germany's large companies now consider a shortage of skilled workers as a business risk, according to an Aug. 15 survey of more than 500 companies by the DIHK chamber of industry and commerce. "It's a very serious problem that could hold up research and development of new cars," said Willi Fuchs, director of the VDI association. Demand for new talent will only grow as BMW, VW's Audi, and Daimler's Mercedes-Benz vie for the No. 1 position in the luxury-car segment. BMW, the current leader, aims to increase deliveries to 2 million vehicles by 2020 from 1.6 million this year. Audi and Mercedes both aim to challenge their Munich-based rival for the top spot in the coming years as they target record 2011 sales and expand capacity. German automakers are looking to counteract the trend by recruiting people outside Germany from growth markets like China and India. They're also partnering with universities to ensure access to new talent and stepping up in-house training programs to retrain staff on electric-powered vehicles. Jan Assmann, a German engineering student, got snapped up in a job search that lasted less than two weeks. Assmann, who will earn over 40,000 euros ($57,500) in his first year, only wrote two applications before landing the position. "I was going to stay at university after my studies to do research, but the career opportunities convinced me to take up a job straight away," said the 25-year-old University of Bochum student, who was sent a work contract 10 days after applying at a software company that handles data management for carmakers and other businesses. With German unemployment at a post-reunification low of 7 percent, the government is seeking to address the dearth of skilled staff by facilitating the hiring of foreign workers. In June, it suspended rules requiring employers to prove a lack of domestic applicants for specific job vacancies, Labor Ministry spokeswoman Christina Wendt said. The government is also looking into lowering the pay threshold that entitles a foreign worker to stay in the country from the current 66,000 euros a year. Such changes in the country though may take years to have an impact, said Willi Diez, head of the Nuertingen, Germany-based Institute for Automobile Industry. That puts emphasis on university partnerships or in-house training to "alleviate the problem posed by the shortage," he said. Rising demand has pushed up wages. Compensation for auto engineers has increased 7.6 percent since 2005 to an average 48,725 euros last year, VDI said. Management-level experts earn 84,200 euros, including holiday pay and Christmas bonuses, a gain of 19 percent over the past five years. Porsche, which aims to create more than 3,000 jobs over the next three years to underpin its goal of doubling deliveries to 200,000 vehicles by 2018, has widened its recruitment outside Germany, where it's also competing with other automakers. "Manufacturers are now vying for talent from China, India and other growth markets," Thomas Edig, Porsche's personnel chief, said in an interview. "We also want to recruit employees from China and India because we need their knowhow and understanding of their home markets." Porsche is looking outside Germany to fill 130 engineering positions in management, electronics and auto assembly at the Leipzig factory, which is located on the site of a former Soviet military training base. Some 30 positions need to be filled by the end of the year to sustain expansion of the plant due to start in October, said spokesman Heiner von der Laden. To combat a potential shortage, BMW is running bachelor's degree programs at special colleges in Ingolstadt and Deggendorf to educate engineers in-house. The manufacturer also partners with Munich's Technical University and Clemson University in South Carolina and opened an education center for electric mobility in May where it trains 150 workers a month. BMW, which doesn't currently have an engineering shortage, may struggle to meet its needs for skilled help in the coming years because of growing demand for talent, spokesman Jochen Frey said. Daimler, based near Porsche in Stuttgart, is enticing young engineers with the security of an unlimited employment contract as part of a trainee program, according to Dominique Albrecht, a spokeswoman for the manufacturer. The company also offers health and fitness programs to keep staff on the job longer. Back in Leipzig, the city is in talks with the local HTWK university of applied sciences to help speed up engineer training for the region's growing needs, which also include a new logistics center from Deutsche Bahn AG's Schenker unit. "As business in and around the city keeps growing, one of the challenges will be to ensure a healthy supply of fresh talent," said Jung, Leipzig's mayor. "We will increasingly have to look in random places to recruit people."